Evergreen grasses stand out in the garden, especially once the cool season, deciduous grasses are cleared in February. With this in mind, they’re useful as either mass plantings, low hedges or pot grown specimens to provide colour and structure. It’s taken me a while to get to grips with them, especially Anemanthele lessoniana, the beautiful Pheasant Tail grass which was mentioned in January’s post. But they’re easy once you know how. It seems the trick with anemanthele is to know at what stage in the plant’s life to cut it back, by how far, and, when. These home-grown anemanthele seedlings were immature 2 year old plants when they were planted in a row beside the drive, so they were not cut back last year. In February 2015 the same plants, now three times the size, will flower fully later this summer. In a reliably warm region these three year old plants could be cut back in spring, just before the new leaves appear. But where we live, on the Welsh borders, the heavy clay is slow to warm and a late spell of cold, wet weather on top of a short haircut might put them off. It’s a waiting game. If we are lucky enough to have an early, warm spring I’ll sharpen the secateurs. I’ve also learned to wait until the mature plants have flowered well, usually in their third summer, before giving them the ‘shaving brush treatment’. I think this is the best way to describe the 8″ high upright tufts you’re left with when you’ve cut them back in mid March. It might seem obvious, but the easiest and neatest way to do this is to make a clean cut through as much as you can bunch into one hand, then the next, and so on, all at the same height. For instance, the grasses terrace has been cleared this week, leaving curving rows of stubble. This is the main border in front of the house, its formality is emphasied by the stonework. There’s no ignoring it in the ‘off season’. As such, I think a uniform finish is achieved by cutting the grasses down by hand. And, the same is true with anemanthele – not only do they look neater, it also ensures they are cut at the correct height to satisfy their requirements. Keeping them happy and healthy for as long as possible pays off. By their fifth flowering year onwards, that’s about seven years from sowing, the plants may start to look a bit tired – looking better from a distance, as in the images above – but by then there are seedlings to replace them. Seedlings do well if planted out in their second year, as they’re less likely to be swamped by other plants, until then I grow them on in raised beds in a shadier spot – where their leaves will be greener. Grown in full sun, in dry ground expect the leaves to have orange tints. 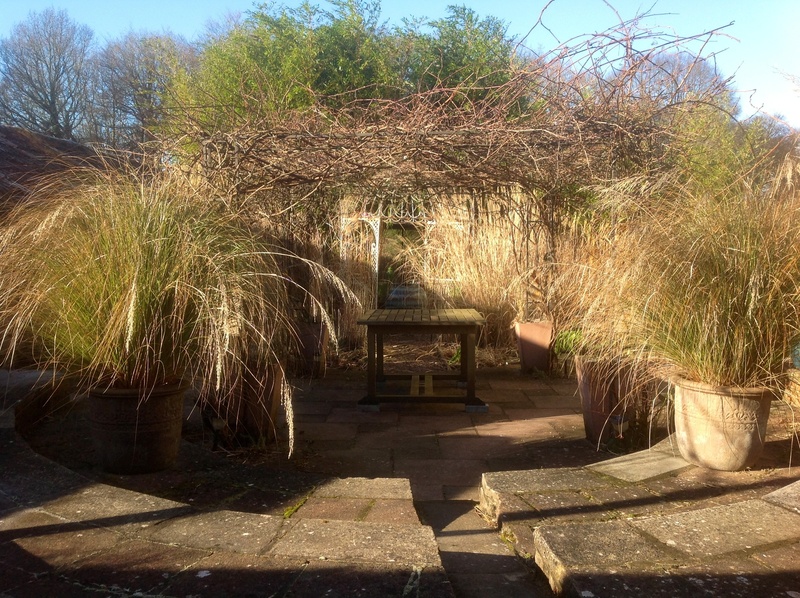 Mature tussocks of truly evergreen Stipa gigantea, now ten year-old plants, have strong winter presence and are very low maintenance. They are proving to be long-lived too, with an appreciated preference for being left well alone. Yet, this is their third planting position, in two different gardens. I’d almost given up on them, but since abandoning them in this spot they have taken off. I think this is due to the sharp drainage at the edge of this sunny, sloping bed, here the clay is quite dry and even stonier than it was before 2012. This was the digger-riddled-rock-dump while work was carried out on the rest of the front garden. At a loss to know what to risk, the stipa ended up here by default. They share the space with the May flowering Iris Siberica ‘Tropic Nights’, interplanted at 1.5 metre intervals. As they’re happily settled, beyond removing spent flower stems, I leave them to it. They can be gently groomed with a spring tine rake, but it’s more likely to be the stumps of last year’s flowering stalks that want removing by hand. These pull out easily in late winter. Flowering stems are produced from spring, they are gorgeous but delicate, so any tidying up of the centre of the plant needs to be done with care. The sharp leaves are winter-grazing proof, gloves are a must. 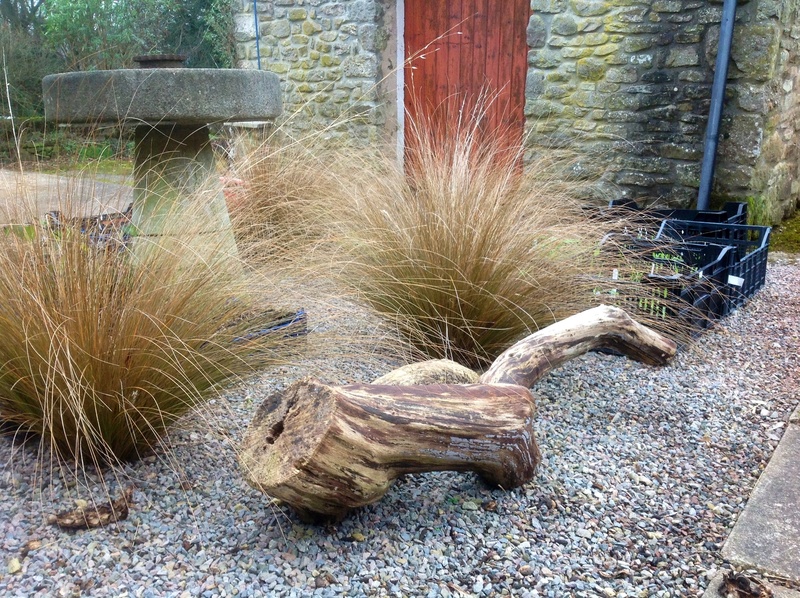 Given my early history with Stipa gigantea, I wouldn’t have imagined growing it from seed. But last year, I was surprised to find a rash of self-sown seedlings. Any young ornamental grass seedling is easy to lift once it has several tufty leaves, I grow lots in pots or nursery beds as ‘heirs and spares’. Checking the stipa seedlings this week, it’s clear they’re rooting nicely in 1 litre pots, the top growth is sturdier than those in the raised bed. I’d expect them to put on substantial root growth this year, until then they’ll continue to be quite top heavy. I’ve left a few of the seedlings in situ in the gravel out of sheer curiousity – I lifted one this Sunday, all I can say is it wouldn’t take a minute to weed them out. 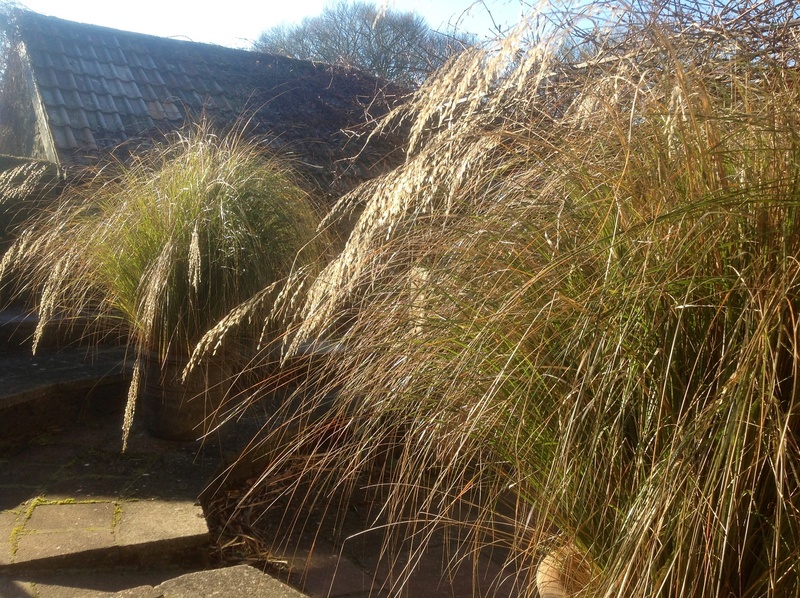 Both of these evergreen grasses are beautiful and structural all year round. Since I started growing them in 2012, they have been trouble-free and demand very little attention to keep them looking good. Chionochloa conspicua ‘Rubra’ eventually makes a mound a metre high. I can’t wait! I have been admiring mature specimens at two regional specialist nurseries for years, Pan Global Plants and Special Plants. Mine, planted two years ago, are now at two-thirds of their mature size. The winter sun brings out the orange tints in the bronze foliage, camouflaging any spent leaves, making them ultra low maintenance. Like anemanthele, they’re from New Zealand, similarly they’re both fully hardy in this garden. This group of Chionochloa enjoys a sunny spot over fertile, moist but well drained clay and they’ve settled in well, even flowering last year. I’ll be on the look out for seedlings in about May. In comparison, Chionochloa conspicua, makes good pot specimens to distract attention from the concrete steps. It’s an olive toned evergreen and a 4′ tall grass that holds its stunning flowers on elegant long stems. As mature specimen plants these were a gift from a generous friend, who, in 2012, no longer had room for them. In 2013 they were potted into large planters. They’ve already filled them, so will be divided by mid March. That will be the time to fish out the few bits of thatch. As with stipa, the flower spikes emerge in early spring. Grooming in early spring is a matter of personal choice. I just snip off the occasional leaf dangling down the side of the pot : my mum likes to give them the full salon treatment, plucking individual strands hidden within the centre of the clump. She is a patient soul. I’ve grown both the green and bronze leaved chionochloa from different sized divisions of mature plants, taken from the edge of the plant. I’d say, the larger the division the quicker the plant establishes – which is from 2 litre or double fist sized piece of fresh material. If the centre of a several year old clump of any grass is woody it’s best discarded. There is an added advantage to dividing grasses into larger pieces – they can be directly planted into the ground. I haven’t yet tried dividing mature clumps of stipa or anemanthele. I’d like to know whether division of these or other evergreen grasses is possible or wise. Meanwhile, we’ve just sown Chionochloa conspicua from seed. It was collected last autumn, today the dried remains are still nodding in the winter sun.